You’ve heard, “Abs are made in the kitchen, not in the gym.” That’s true! Food is very important to maintaining the health of an athlete or to help with weight loss. Pancakes are one of the most popular breakfast foods, but normal recipes are FULL of fat and carbs, with little to no protein. Here are some recipes of some healthy, and still delicious pancakes. Blend or mash all ingredients together then pour into a pan on medium heat. Cook for 1-2 minutes on each side and enjoy. 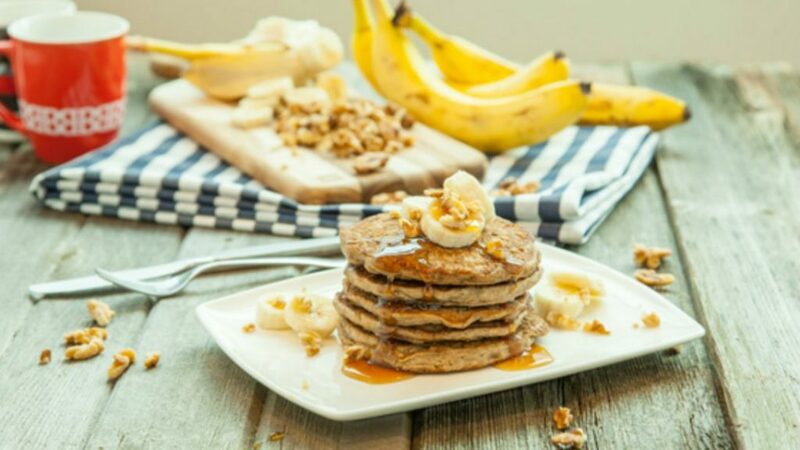 This recipe is great because bananas have carbs and healthy sugars to give energy, the egg has protein, and almond or oat flour is gluten free and helps keep you full. You can add some of your whey protein powder to this recipe as well. Blend all ingredients together and then pour into a pan. Cook on medium to low heat and flip when bubbles appear. This recipe is one of my favorite recipes because it is delicious and helps keep me full all morning! Also, this recipe is versatile because the flavor of the pancake can change if you use flavored whey or casein protein powder. Try out both of these recipes instead of the normal unhealthy pancake options today! Also Trying a new sport, joining a new class, or coming to a new gym, like Sampa Jiu Jitsu , is a great supplement to healthier eating habits. When you join a gym like SampaMartial Arts, you get exposed to diverse classes such as Muay Thai – Kickboxing, Wrestling, Brazilian Jiu Jitsu, and Fitness classes. At these classes, you’ll be able to meet local people from the Walnut, Glendora, Diamond Bar, West Covina, and Azusa, San Dinas and La Verne areas that all want to improve themselves too! If you are interested in joining our Sampa Family to improve your health, confidence, and fitness, you can join us in Walnut by calling (909) 444-9944 or in Glendora at (626) 335-4971.